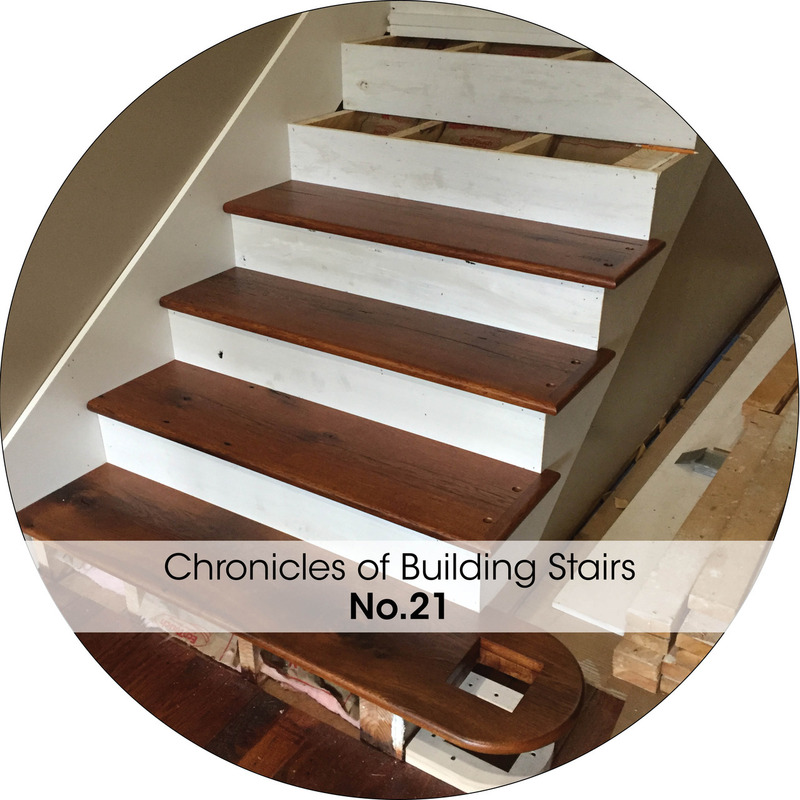 The Chronicles of Building Stairs…..
As architects and designers, we’ve probably all been on a job site at some point in our careers where our knowledge and understanding of how something is built has come into question. It takes a thorough understanding of how things are assembled and the knowledge of how tools are used in order to properly detail our construction documents. Those documents serve as an instruction book for the contractor and if designers cannot convey the intent through that knowledge, no one will be happy with the end results. Long story short, I was given an opportunity not many architects or designers get, to design a house for my parents. Everyone’s dream, right? Well not only did I get to design it, but I also put in a lot of hard work getting it finished, occupiable, and meeting applicable building codes which included a variety of things from painting, building porch railings, design/building a range hood, installing cabinets and countertops, trim work, and most importantly, what this DOTS blog entry is about, stairs. The house is a very traditionally styled farm house that sits along the edge of a creek on 70 acres in middle Tennessee, and its three total stories with a full basement that includes a two car garage. The main living level has a master suite, kitchen, living spaces, and a 12’ wrap around porch that would make anyone jealous. While guest bedrooms, a bathroom, and attic space occupy the top floor. I’ve done my share of woodworking in the past but never attempted a finish carpentry project of this caliber before. So off I went, diving head first right into the deep end of the stair pool! Most important tool you’ll need is a sharp mind! I can’t tell you how many times I had to think 12 steps ahead during this process but it’s a lot. Then there’s the basics, Angle finders, squares, sharp chisels, 2-3 measuring tapes, 14 pencils, a good table, chop, and circular saws, router and table, clamps of all varieties, biscuit joiner, wood glue, drill (press if you have one) and bits (forstner bits will become your friend), air nailers, sanding paper, levels of varying lengths, a Japanese pull saw (my favorite), and of course the second most important, patience. I wanted a seamless transition between the skirt and the baseboard, so to achieve this I started by drawing the baseboard on the wall then using a 6’ level to scribe the rise/run of the stair onto the wall top to bottom and then again at the correct height to match the base. Next came risers and treads in that order. There are metal angle finding tools available to accurately scribe your treads and risers to the skirt but I was felling crafty so I made one out of a 2×4 and some scraps of oak that worked quite well as you can see in the last two photos above. The risers were set with shims, glue, and a nail gun squaring everything as I went, and only nailing where it would be covered by trim work or the tread when installed. Next came the treads. After planing all of the treads down to our desired thickness and scribing ends, the nose was routed with a 1/2” round-over bit, sanded, and finished before final installation with heavy duty adhesive. To finish off this set, I made the top landing nosing out of left over 3/4” flooring, laminating two pieces together to create the nosing thickness that matched the rest of the solid oak treads. That was the end of the easy part. The main hallway stair leading to the upstairs guest bedrooms, is commonly referred to as an open end stair, meaning one or more sides of the stair is open to the room. These types of stairs are much more involved in finishing, technique, and craftsmanship mostly due to the fact that they require more ornate railings and treads with end returns. To start though, the process of fitting the skirt board along the wall was very much the same as the enclosed stair below, but that’s about where the similarities end. The outside skirt board has to cut at each tread and mitered at each riser, and in order to accomplish this you have to carefully layout the angle of the stairs on to the wall so that your board completely covers up all the edges of the stringer or carriage. Once I had all of my lines laid out on the boards it was off to the chop saw cutting what would fit to the bottom side of the treads first then following up with an angled miter cut for the risers. Now the chop saw obviously has a round blade which won’t allow you to cut all the way through on these cuts without cutting into the finished face of the board, so a good handsaw, or my personal favorite the Japanese pull saw, really comes in ‘handy’ here. Since our risers were around 5/8” in thickness and the skirt board was 3/4”, the miter cut has to take that difference into account and the cut has to be made from what will be the finished edge to cleanly match up to the risers and not where the leading edge of the carriage is. See them installed below. The next step for me was to set the top newel post. With the design intent of having the handrail of the stair hit the top newel post at the same height at the guardrail of the landing, I set the height of the newel so that the center of the rail would mount directly in the center of the top open space of the newel. After a lot of mind games and figuring out exactly where the centerline of both rails needed to be on the stair and landing, notches where made fitting it nice and snug to the landing and skirt board, while leaving room to accept the tread in the near future. Following the top newel, I began to layout the bottom bullnose tread to accept the other newel post. Since I had already figured out where the rail was running on the stairs, this ‘step’ was a little easier. So after scribing the inside edge of the tread to the wall, I laid out my lines, found the center point to my newel, and using just a thin piece of scrap wood that I drilled a few holes in for a compass, laid out the half circle to be cut. Using a band saw, I was able to pretty cleanly cut the radius out, sand and router the exposed edges of the tread. To make the starting riser was an interesting trial and error. My first attempt was to use a solid piece of oak riser and scarf cut it on the table saw in order to bend it around the form of the bullnose. I will say this is about the only thing that didn’t go quite as planned! Instead, I went the route of layering up bendable plywood to equate to the same riser thickness and skim coated wood filler to fill in between the now open fibers of the wood before painting. The production of all the other treads came next, and with an open edge stair this is a process. As any woodworker will tell you, the end grain of wood is tough to finish because of its unpredictability and that it typically soaks up a lot of stain, making it a much deeper color than the top and side grains. So that is typically the reason for the mitered returns on the end of stair treads, and it also looks really nice. To accomplish this small feat though, the treads must be a few inches longer than your rough tread width dimension so that you have the extra material to remove when you’re ready to scribe each one to the wall. So to start with, I clamped about 4-5 tread together, made a miter jig for my circular saw and screwed it into place where I knew the material was being removed. Once all of those were cut it was on to the returns. Using a biscuit jointer and a Craig jig to recess screw holes, I glued and screwed each return into place. Once that was complete, I carefully laid out all of the baluster locations on each tread and bored a hole to receive each one with a forstner bit and a drill press for consistency. Afterward, all of the exposed nosings of the treads were routed, then each tread was sanded, stained, and finished before final installation. To complete all of the horizontal surfaces, I needed to make the top landing transition in the same fashion as the previous set of stairs only this one was nearly 8’ long and notched around the top newel post! Finally came assembly of the rails and setting all of the balusters! Having never done these before, I have to say it was a little easier than it looks. Using scrap pieces of the outside skirt board, I was able to set the pieces of the rail flat on a tread to find the correct angles each piece of the rail needed to be cut at to fit seamlessly together. After the lower transition of the rail was complete, it was temporarily attached to the bottom newel post and set to the correct height to begin laying out the top transition. Since the landing rail was at a height of 42” and I wanted both rails to hit at the same level on the top newel, a two rise gooseneck transition was used to get the exact height I wanted. I must say… I think it turned out really nice. Once the rails were complete it was all downhill from there, as the baluster installation went rather quickly having already laid out the spacing in the treads. It was then just a matter of cutting each one to fit, gluing and nailing them into place. So here’s the nearly finished project only lacking some cove molding below the treads and some final painting. While this was a rather rewarding end result, I really hope there are no more stairs or railings in my future. I think I’d much rather just draw them!